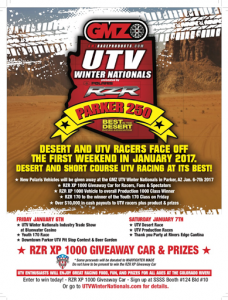 GMZ Race Products Inc. and Polaris RZR® will kick off the new year by offering the first UTV race of the season in beautiful Parker Arizona on the edge of the Colorado River January 6-7th, 2017. The UTV Winter Nationals has been designed to give UTV enthusiasts a chance to immerse themselves within the sport and provide their families and spectators a first-class experience by offering viewing areas, exclusive events with food, drinks, games and prizes for all ages. GMZ Race Products Inc. and Polaris RZR® have teamed up with Best in the Desert Racing Association and additional media partners to offer a 250 mile race for the UTV Desert Class on a 75 mile loop and a 40 mile race for the Production Short Course Classes on a 10 mile loop. This two-day event will feature Tech and Contingency with an industry trade show on Friday in the Bluewater Casino Resort parking area. Friday will be non-stop action including some of the biggest UTV vehicle and accessory manufacturers in the world showcasing their unique aftermarket products and special promotions alongside race teams at Manufacturer’s Row. Friday afternoon the 170 Youth Race will be taking place shorty after. The fun will continue Friday night with a Pit Stop Competition where the best UTV teams in the country will showcase their fastest simulated pit stops for the chance to win prizes. Saturday afternoon after a full day of rigorous racing, the Production Class winner will take home a brand new 2017 Polaris RZR XP® 1000. An additional 2017 Polaris RZR XP® 1000 vehicle will be a prize to anyone who entered the Winter Nationals Giveaway. Proceeds will benefit Warfighter Made and distributed as cash payouts to the race winners of certain classes. The UTV Winter Nationals will end Saturday night with a ‘Thank You Cocktail Party’ open to all competitors and their families at the Bluewater Resort Casino. Race fans unable to attend The GMZ UTV Winter Nationals Presented by Polaris RZR® can tune-in Saturday, January 7th via multiple websites for the action-packed live stream (TBD). Don’t miss your chance to view this extraordinary event for all UTV racing enthusiasts! GMZ was co-founded by three partners with over 35 years of combined race and design experience. With Brandon’s and Scott’s racing background ranging from Go Karts, ATV’s/UTV’s to NASCAR and just about everything in between, you can be sure you are getting a quality product. Combined with Paul’s extensive background in CAD designing, you can be sure to have one of the strongest wheels and tires available on the market today. Our GMZ ATV/UTV and Karting products have been thoroughly tested and approved by many top racers and enthusiasts alike. Our wheels and tires have withstood some of the roughest deserts and racetracks. Whether you’re a weekend enthusiast or a full time racer, we have superior products at superior prices. So if you’re looking for a product to give you that edge, think GMZ!